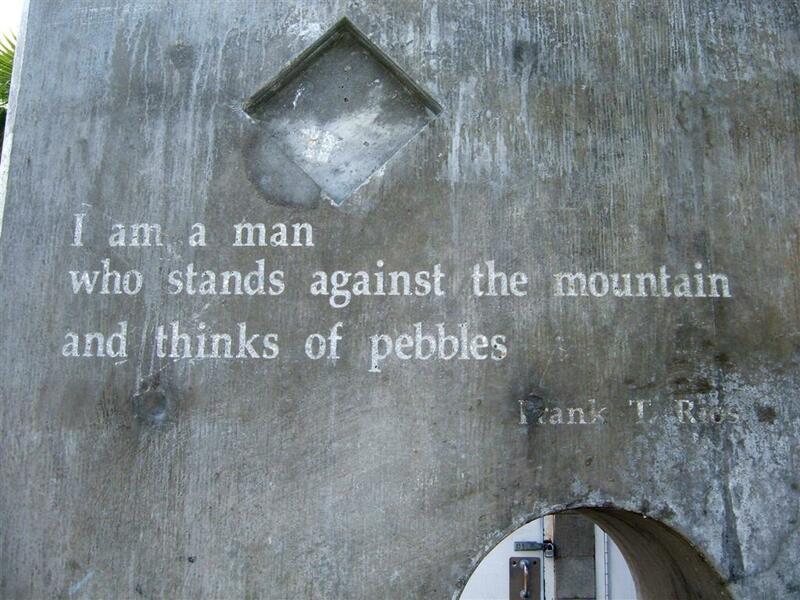 Good quote: I am a man that stands against mountains and thinks of pebbles. This quote is by the bathrooms along the walking strip of Venice Beach. I loved it so much the first time I saw it that I had to come back with a camera to take a picture of it. I quoted it once, and my friend Codie, knew exactly where the quote came from – Venice Beach Restroom. At least both of us caught the power of this quote. I think this ties great to Jesus’ quote about “faith of a mustard seed, being able to move mountains.” Maybe this isn’t’ a literal, physical, tree-covered mountain. Maybe this is a mountain in a different manner, mountains such as going to China, where you face communism, a different language, poverty, imprisonment, cultural differences, or planting a new church in Orange County where you might be told that there are already too many churches for a new church to be needed, where you might face location problems, time problems, financial problems, and in a sense these are mountains. Being a college student and having to juggle classes, work hours, play time, homework time, sleep time, eat time, God time all in 24 small hours can be a mountain. With faith in Jesus though, these mountains can be moved because they are just pebbles. Whenever I hear Jimi Hendrix’s song, “Voodoo Chile,” I am fascinated with the line that says, “I stand up next to a mountain, I chop it down with the edge of my hand, cuz I’m a Voodoo Chile baby, Lord knows, I’m a Voodoo Chile!” I always think, that’s me, I have that power! Not because of Voodoo, but because of Christ in me, my hope and glory. I am a Child of God.